Some monthly reports include a PDF report from Google Search Console ( formerly called Google Webmaster Tools ) called ‘Analytics Queries‘. The Search Queries page provides information about Google Web Search queries that have returned pages from your site. In addition, you can also see information about the pages on your site that were seen most often in search results (top pages). This is a report that is produced not from your actual web stats, but from Google Webmaster Tools about searches that are related to the terms Google believes are related to our site. The report includes terms such as ‘query list’, ‘impressions’, ‘clicks’, ‘CTR’, ‘average position’, etc. 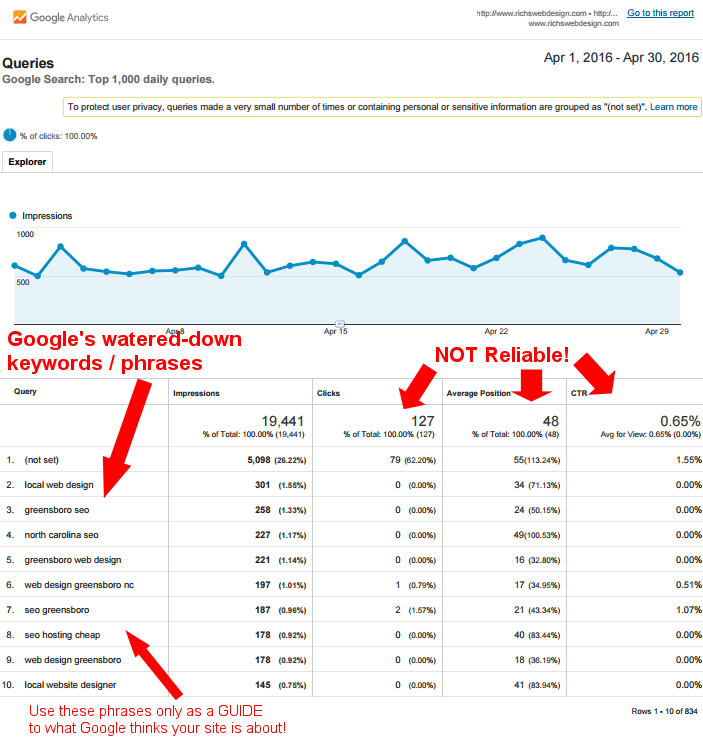 For a full explanation of these terms, go to this page – Google Webmaster Report Terms.